Hello! It’s time for another “What to Wear” installment. We have been receiving lots of new items in the past couple of weeks. Please go to resoul.com to see the latest arrivals! This week we focus on the color yellow. People tend to get intimidated by color but, really there is nothing to be self conscious about. Think of colored shoes as an added accessory to your basics. Yellow looks great with neutrals such as white, gray, black and navy. We really like yellow with blue, as you’ll see in the following examples. We have a new line in the shop here at re-souL, it’s called Satorisan. We are all smitten with this new Spring collection and inspired by the travels we would take wearing our shoes that are oh so comfortable. Satorisan is an international lifestyle brand whose attitude is grounded in balance and harmony, honesty and respect, quality and comfort, love and caring. Developed in Valencia, Spain and produced in Vietnam, Satorisan is into “live by the walk”. They believe if your feet are happy, the rest of you will be happy too. Green Jasmine soles by Satorisan. Their signature green sole is a special compound similar to that used in competition car tires, which increases the traction properties on dry or wet conditions. The leathers are sourced in Spain and the canvas fabric is milled in Italy. The international collaboration of designers and manufacturers produce an unbeatably comfortable product. We like the way they look and feel, and we hope you will too. To see more of the Satorisan collection visit our website at resoul.com. We in the Pacific Northwest have always liked our clogs. It is an all-season item that can be worn in so many ways, pants, skirts, dresses, etc. With the forecast calling for warmer days this September, we thought we would show you how to style our re-souL “Tilda” clog this season. Wide leg trousers are all the rage this season. 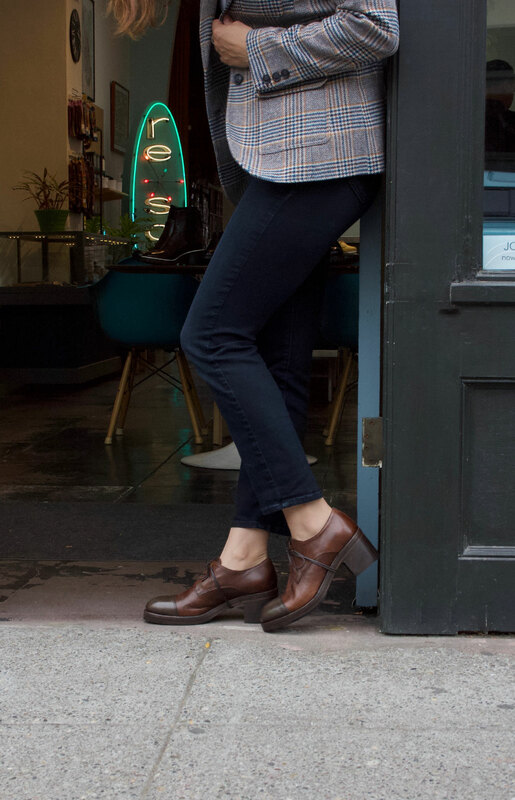 We like to wear clogs with these pants because they balance out the look of the flared leg. You can still look professional wearing clogs if you keep your pieces tailored and when the weather becomes a bit cooler, you could add a blazer to to ward off the chill.